Further discounts - 5% off £50+- use code 5PC and 10% off £100+ -use code 10PC + Free liners with 10 nappies, free wet bag with 15 nappies and free liners and wet bag with 20 nappies. Plus further discounts - spend £50+ get 5% off (use code 5PC) spend £100+ get 10% off (use code 10PC) and all nappies are included in multi buy deals and discounts! 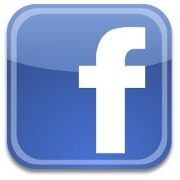 Free liners with 10 nappies, free wet bag with 15 nappies and free liners and wet bag with 20 nappies. Pre-folds are simple to use and require minimal folding. 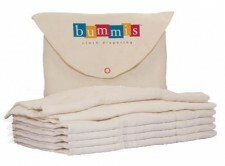 These beautifully made prefolds from Bummis are stitched into 3 sections, with the middle section being the thickest with 8 layers of organic cotton. They are an excellent option for newborns babies if you use with newborn wraps (motherease airflow xsmall or bummis duo size 1) because they are nice and small, very low cost and, also most importantly, they will contain and keep in all that runny explosive poo! They fill the size gap between birth and the onesize nappies which usually don't fit well until 9-10lbs. They really are an excellent newborn nappy if you are prepared to master the folds and nappi nippa. Once your baby is too big for the folds using the nippi, use the prefold as a pad with the peenut wrap, flip wrap or bummis Lite wraps. This makes these nappies really cost effective, with a couple of different wraps the prefolds can be used as nappies until potty training. Bummis prefolds are made from 100% certified organic cotton twill, they are wonderfully thick and thirsty, a natural, organic fabric against your baby’s skin. They come in an unbleached colour, and the more you wash them, the softer they become. Prefolds are classed as flat nappies and will need an outer wrap. They are easier to use than terry squares and work best on younger babies when used with nappi nippa's Prefolds are less vulnerable to detergent and urine build up and are less likely to retain odours. They are also really versatile for example use as a nappy, a burp pad, or insert/booster for other nappies and they make great cleaning rags when you are finished nappying . Organic cotton IS hands-down the greenest and most sustainable choice in fabrics. Our Opinions - Prefolds can look scary and complicated but with a bit of practice they are a great low cost option. It can be worth having just a few for those moments when you run out of clean nappies! Prefolds can also be used to stuff other nappies for example the Bumgenius, Fuzzi Bunz and TotsBots Easyfit and they work really well with the Flip and peenut wraps too and are cheaper than the inserts you buy with these two wrap systems. 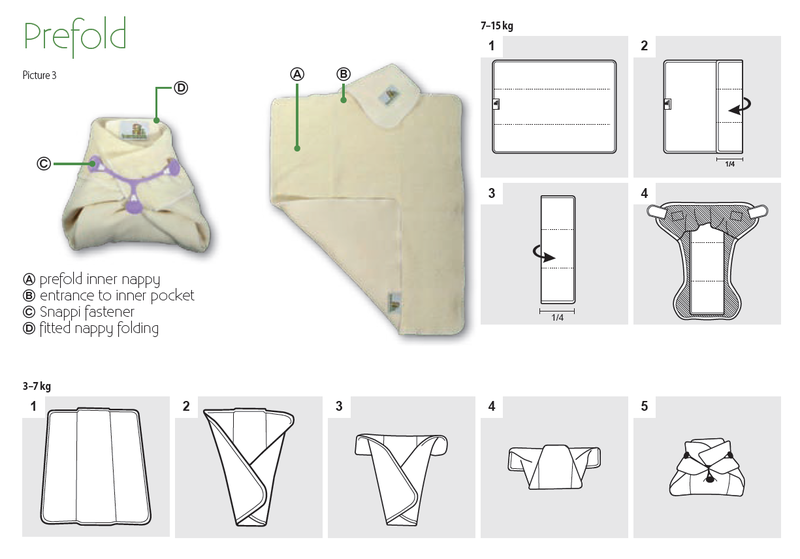 However Prefolds would probably not be ideal when other people are looking after your baby as they are a bit more complicated to use, especially if you are folding them and using nappi nippa's. In my 10 years as a Nappy advisor I have met a significant number of parents who have used Terry or Prefold nappies very successfully and happily. Flat nappies are the best value for money and last brilliantly for successive babies. So if you want a really low cost cloth nappy system are prepared for that bit of extra input, go for it, it is not rocket science! 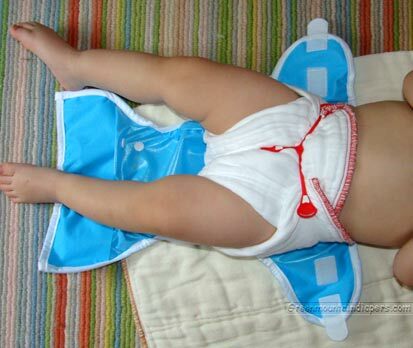 Our Tips – Use Nappi Nippas to make fixing the nappies in place much easier. (Nappi Nippas have replaced the safety pin and are easier and safer!) 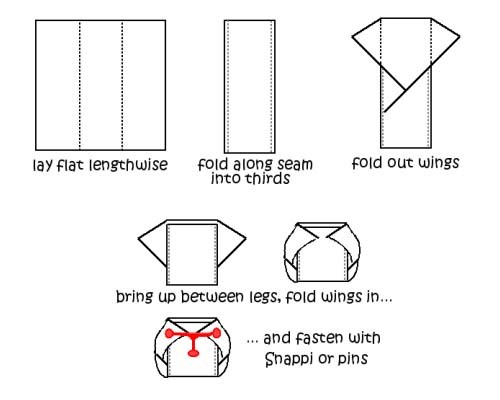 Look at our folding instructions and watch videos on ‘you tube’. Practice on your teddy bear before your baby arrives. 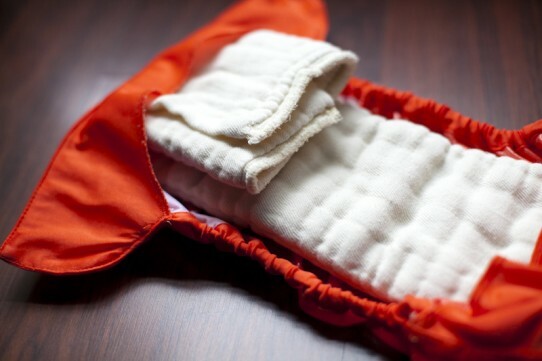 Fleece liners can be used to keep your baby’s bottom dry. Bamboo boosters can be added for extra absorbency. Use with either the Flip or Peenut wraps in place of the inserts sold with these wraps as part of this system, this works out much cheaper, and increases nappy stocks meaning you can wash less often plus keeps cost down considerably. 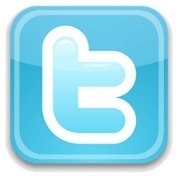 I am an independent washable nappy specialist who has been promoting and selling cloth nappies since 2006. I only sell nappies that I have either used on my own children or which have been rigorously tested and approved by me and my colleagues. I am passionate about reusable nappies and believe that with a high quality cloth nappy (not necessarily an expensive cloth nappy) and the right advice and support, any parent can succeed and even delight in ditching the disposables!